Tiger Heaven Spa & Resort Ranthambore is nested edge of the Ranthambore National park and around 10 km from sawai Madhopur railway station. It is gorgeous place to be propitiated by great and warm hospitality in Ranthambore Tiger Reserve. Tiger Heaven resort has wide meaty alluring lawn and garden with luxury accommodation block. The hotel prides itself on being the region's biggest garden. The hotel's architecture is inspired by Rajput and Rajasthani style. Accommodations, lounge and dining area are splendid example of old architecture. 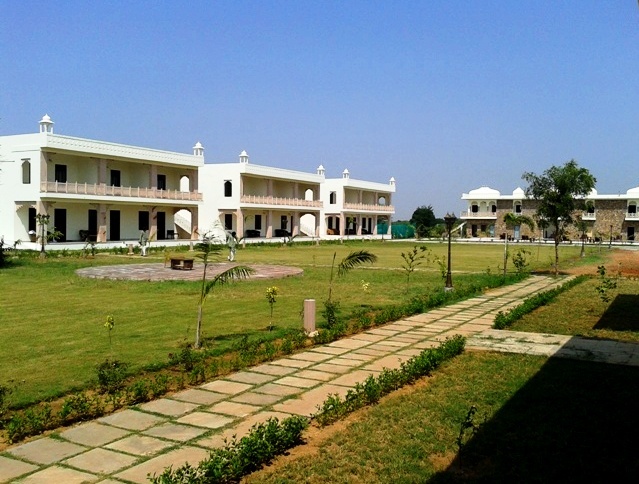 Each block of resort is equipped with veranda. After Jungle Safari, to relieve fatigue, you can sit on the porch and enjoy the surrounding views with tea and coffee. Tiger heaven resort offers modern facilities with best service in its bushland. Aravali rolling hills in front of the resort offers unexcelled forest ambience. Tiger heaven resort offers in-house swimming pool and spa facilities which are alleviate your weariness after returning from the Jungle safari and sightseeing.Tiger Heaven Spa & Resorts is the perfect blend of complete calm and fabulous generosity. Tiger Heaven spa & Resort Ranthambore offers 40 air conditioned well furnished luxurious room with spacious attached bathroom. All living rooms are outfitted with modern conveniences such as mini bar, WiFi access, tea coffee maker, bathrobes, intercom and attached bath home with running hot and cold water. There is king size swimming pool along with other facilities like Spa, Jacuzzi, Steam room, Yoga & Meditation and Gymnasium. Tiger Heaven resort offers multi cuisine restaurant with Chinese, Indians and Continental dishes and private dining can be arrange on request in the garden area. You can enjoy garden view from your sitting area with a sip of tea & coffee. Tiger Heaven Spa and resort is ideal place for wildlife lover, photographer, couples, families and group.